← Robots Taking Over Journalism? Routledge has just published Boundaries of Journalism, edited by me and Seth C. Lewis. Seth and I got the idea to do this book a few years ago when we realized we were both interested in how the concepts of boundaries and boundary work could be applied to journalism more than it has been. It seemed to us that the present discussions about journalism often involved discussions of insiders and outsiders or delineations between what is and what is not journalistically appropriate. And in many ways the very existence of boundaries was being questioned. So, we lined up a terrific group of authors and then gave them space to think about boundaries. This book is a result of these efforts. It appears as part of Barbie Zelizer’s Shaping Inquiry in Culture, Communication, and Media Studies series put out by Routledge. 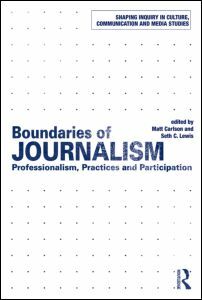 I wrote an introduction to the book titled, “The Many Boundaries of Journalism,” which synthesizes the existing work on boundaries generally and in journalism studies specifically. The aim of this chapter is to piece together strands of research from over the years and place it in a coherent framework. Hopefully, this framework will in turn spark new research on boundary work and foster both future empirical and theoretical insights. More information on the book.